N.B. I am posting for the first time two reflections for Pentecost which I wrote some 5 years ago. My past two weeks have been a journey filled with surprises and serendipity. First in the list is my first time ever in the “land of surprises,” Papua New Guinea, at the capital city of Port Moresby, where I spent some time to do some “formative” work with our congregation’s pre-novices (seminarians). Topping the list of “surprises” was the sight of what the Salesians have done in a period of 26 years, despite massive challenges posed by so many aspects of PNG life, not excluding the culture, characterized for the most part by what sociologists and cultural anthropologists refer to as “cargo cult mentality,” a sort of dependent attitude that looks more at what they can get that what they can give in return. Despite this huge obstacle, Salesians and so many other brave missionaries continue on toiling for the Kingdom, despite seemingly little success, from the purely human point of view. Surprise gave way to serendipity as superficial impressions paved the way towards faith-filled reflection which led me to see the extent of the good being done despite all those seemingly impossible obstacles in the difficult path of evangelization encountered by those patient missionaries who plod on, despite so little human consolation. Surprise and serendipity turned to wonder and hope when I saw PNG’s exact opposite, at least in terms of material development – Singapore, that fabled city-state built, reportedly, on what other neighboring countries were all perceived to lack. Singapore, at least according to one of its founders, Lee Kwan Yew, was built on discipline, that important ingredient that was blatantly missing in countries like the Philippines, Malaysia, Indonesia, and others. Discipline was the “good news” that the founders of Singapore inculcated in the hearts and minds of all those hopeful people who, in a post World War II context, saw and dreamed of endless possibilities, and eventually worked for them together. They all came from various places … from China, India, Malaysia, Britain, etc. A multi racial society, they spoke, and still speak, different languages. Writing as I do from Tagaytay City, the Philippines, a day after I got back from the twin-city whirlwind tour, in between preaching to, and processing retreatants, my thoughts anent Pentecost Sunday revolve around the same issues of surprise and serendipity. Pentecost Sunday is a day of surprises. A community of believers coming from different and far-flung places saw sudden unity at the coming down of the Holy Spirit in the form of tongues of fire, accompanied by wind and resting on the heads of each one. The big surprise is twofold … they spoke different languages, and they were heard each in their own respective languages. Surprise graduates to serendipity as St. Paul fleshes out what the coming of the Holy Spirit means in concrete … different works, different ministries, many parts, many members, all attaining that elusive unity on account of the one Spirit. At PNG, the land of surprises, I saw, indeed, some pleasant surprises. There is discouragement, to be sure, on the part of those who have been toiling for years in what appears to be an unproductive vineyard. But the greater surprise is the gift of dedication, the gift of commitment, the gift of ongoing presence of the very same discouraged people that can only come from a power that is beyond them all, the power of the Spirit, who has come with an earth-shaking and life-altering force on Pentecost day, to rouse a frightened band of believers into becoming a forceful bonding of believing and belonging people, who, like St. Paul and thousands of saints in the roster of the Catholic Church, “dared and hoped,” hoped even against hope itself, and went on doing what they were sent to do. There are lessons to learn from all these surprises, including those of Papua New Guinea. They are lessons on hope and on allowing the force of the Spirit to lead individuals even in the throes of discouragement. There, too, are lessons to learn from the serendipities I saw in that tiny city-state that is Singapore, who, despite its famous material development, can still boast of churches filled to the last seat on Sundays, and even on ordinary days. There are lessons on what hoping and daring can lead people to, on what visions and dreams can make committed people achieve. There are lessons on what we as a Filipino people, richly endowed by God with so many gifts of nature and grace, can do with that precious capital, so much wasted, so much untapped, and so much ignored, because of a culture of sin and death, and what sociologists call the “Filipino culture of insecurity” that leads to our notorious “social individualism” that makes moral considerations secondary to family or small-group concerns, needs, and considerations. Pentecost Sunday liturgy revolves around the idea of gift. We are told about an entire house “being filled with a driving wind,” “tongues of fire” “parting and resting on each one,” and each one “being filled with the Holy Spirit.” St. Paul speaks of “different kinds of spiritual gifts,” and some “manifestation of the Spirit given for some benefit.” The alternative second reading says more. It enumerates the “fruits of the Spirit,” namely: love, joy, peace, patience, kindness, generosity, faithfulness, gentleness, and self-control. The Gospel, for its part, confronts us with a double gift from the Risen Christ – two gifts that are intimately linked to each other: peace from the Lord, and the Spirit who is to be behind a bigger gift - the power to forgive sins. Gifts galore, these all are! Gifts to acknowledge, cherish, and nurture by a people deemed worthy enough to be gifted by this world’s tremendous lover! 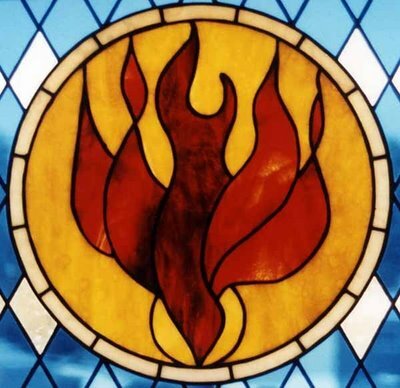 This, at least partly, is what Pentecost is all about – a day of giftedness, a day of filled-ness, a time and season “to rejoice at seeing the [Risen] Lord” in our midst once again. That boy who stands for most of us could not fully appreciate what he got. Like him, we cannot appreciate what we are getting for one simple reason: we remain and get bogged down only on the level of the gifts received. We fail to transcend the gifts and lose sight of an important truth – the truth of our giftedness. Merely counting gifts can make one satiated, but not satisfied. Merely having gifts can make one feel filled for a while, but never fulfilled. The former has to do with having more; the latter has to do with being more. This comes from the deep realization that one is gifted, enriched, blessed, and loved by history’s greatest lover of all. This means being “filled with grace,” because one is filled, not just with “presents” from the Lord, but with His “presence” in our lives. But there is still a third level of transcendence that Pentecost reminds us of. We have not only received gifts from above. We are not merely gifted beings who are loved by God with a love of predilection that has no parallel on earth. We are meant also to be “given” like Jesus and the Spirit were. “As the Father has sent me, so I send you.” After breathing on them, the Risen Lord said, “Receive the Holy Spirit. Whose sins you forgive are forgiven them, and whose sins you retain are retained.” The Spirit’s gift of truth, his guidance to all the truth given to the Church, is meant to be, in turn, a gift to others, a mission, even as Christ and the Spirit are in a “joint mission” from the Father. As we prayed at the start of this Mass, “let the Spirit you sent…continue to work in the world through the hearts of all who believe.” For we all have received gifts. We are gifted. And we are meant to be given in mission to the world.